Amidst the violence, there are signs of a small but growing peace movement in Afghanistan. Kate Adie introduces stories and insight from correspondents around the world. Amidst the violence, there are signs of a small but growing peace movement in Afghanistan. Kate Adie introduces stories and insight from correspondent around the world. 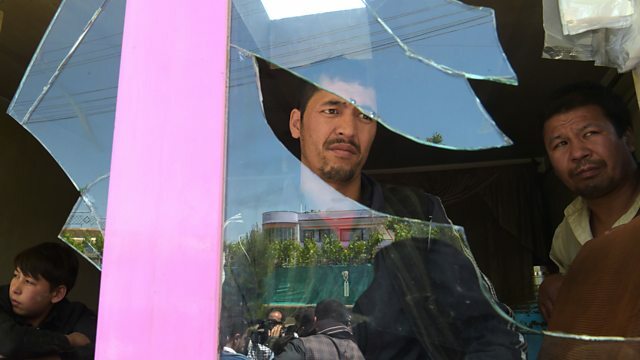 "This has again become, largely, an Afghan war," says Kate Clark in Kabul, " it is now overwhelmingly Afghans killing Afghans," but she has also noticed growing public exasperation at the conflict. Diana Darke joined the British peers and priests recently granted access to Syria by the government, but as an Arabic speaker who knows the country well, she was able to look beyond the official narrative and what her guides wanted her to see. In a refugee camp in Bangladesh, home to some of the hundreds of thousands of Rohingya people who have fled violence in Myanmar, Aisha Gani stumbled across an unlikely scene. As they prepare their makeshift homes for the monsoon season, young men still find time to party. Kevin Connolly has been rummaging through his attic and wondering what the changing design of matrioshka, or Russian, dolls reveal about Russia today. And Sophie Raworth explains what it's like to run 150 miles through sand dunes and over rocky cliffs in the Moroccan desert - carrying everything you need to survive for six days. "My body is so much stronger than my mind ever believed"
Sophie Raworth on running 150 miles in the Moroccan desert for the Marathon des Sables. Kate Adie introduces her personal selection of outstanding correspondents' reports. Practical tips from our own correspondents… and some dire warnings! A selection of fascinating and entertaining stories from reporters around the world.